Daisy, I confess... I think it would be fun to go to Disneyland with Mr. Shrill. NO!!!! Now I'm going to hear THAT SONG all.day.long! AAAIIIEEEE! I don't blame Mr. Shrill for bringing a barf bag on the Tea Cup ride. I could have used one too. Oh, my tummy! He shoulda taken you guys!! Oh my, he knows how to have fun! Mr Shrill really gets around! 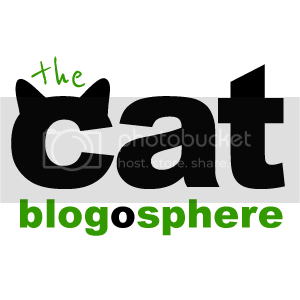 pee ess - Mom says she has that earworm now too!!! Mr. Shrill seems to travel alot. 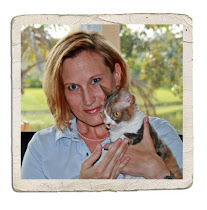 How did you meet Mr. Shrill? He is quite the interesting character no doubt about that!! Looks like he had a really fun time at Disney World. Yup, our Mom doesn't like those rides either. It did look like he had a good time but too bad Daisy and Harley didn't get to go. Your turn next time. Oh dear, Mr Shrill. You are silly. Mr Shrill is so funny! We think it would be fun to follow him around because he is outrageous! mawhawhaw! Hah, we would be outta der at Small World too...and mom almost made her frend barf on da Tea Cups. But he shoulda showed more respect in da Hall of Presidents. Other den dat, looks like he did okay. Daisy and Harley need to arrange another trip with Mr. Shrill and enjoy the day. Did Mr Shrill bring you any goodies back from Disneyland? Well, at least they had each other and what a pair they must have been. Wow...Disneyland! I hope Mr. Shrill behaved too. Somehow I don't think Mr. Shrill behaved very well. . . . .
Mr Shrill sure gets abowt a lot! Mr. Shrill is lucky they didn't think he was an escaping mascot when he tried to leave! Aren't you glad you didn't go to DW with Mr. Shrill? Mr Shrill knows how to have fun but we think you two should have been able to go! Thanks Sarge! I had almost been able to ignore it! Looks like Mr. Shrill had a great time at disneyland! Wow! Mr. Shrill and Mr. Snail travleing together! What a pair. Looks like Mr. Shrill had a bit of fun! oh my!! mr. shrill, i would not enjoy a trip to disneyworld with youo. 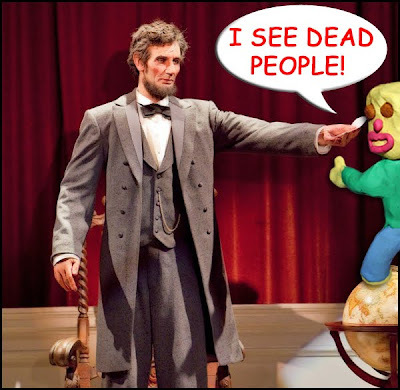 old abe lincoln, i remember thinking that was the most boring "ride" at disneyland. it was always the last thing we did as a child. I think Mr. Shrill is a party pooper! Looks like Mr. Shrill enjoyed Disney. Perhaps, they should make him part of the entertainment. Silly Mr. Shrill! We bet he gave Snail endless heart attacks with his shenanigans. Mr. Shrill, don't puke in the teacups! It looks like a great trip! Mr. Shrill got to go to Disneyland? Somehow that doesn't seem fair at all! 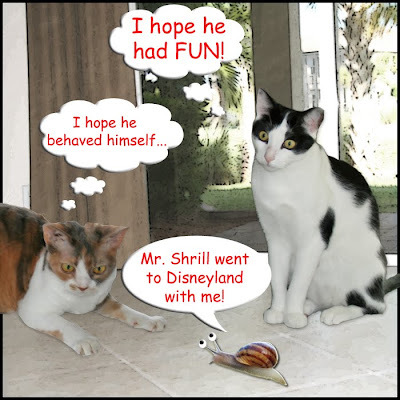 It looks like Mr. Shrill had lots of fun and wasn't too naughty. Mum just shoutes'Arghhh! I've got that song in my head too'. Oh poor Mr Shrill didn't handle the tea cup ride too well did he? I do hope it didn't ruin his whole day. I'm not sure I would like to go to Disneyland with Mr. Shrill. I guess it's no good asking Mr. Shrill to keep his voice down -- he seems to shout about efurrything. It's really hard to tell if he had a good time or not. 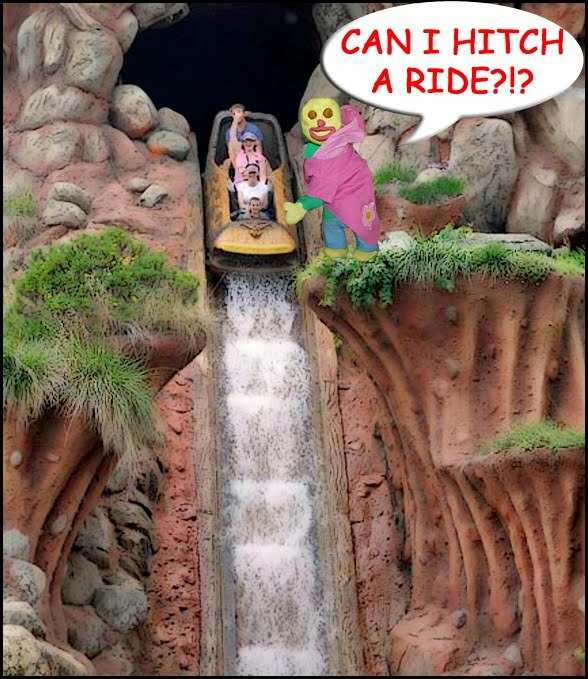 Wow we are amazed that Mr. Shrill got to see so many attractions - we thougth they would have kicked him out way before he was able to see so much! Well, he made a memorable trip for the people he ruined it for. Looks like Mr. Shrill had lots of fun there! We has to agree bout the tea-cup ride. Who thought that would be fun? Disneyland sounds fun! My mom has never been to any Disney theme park... she likes camping too much in the woods! 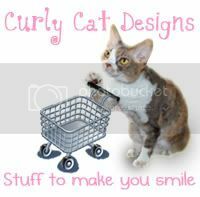 That's funny, the teacups make my mom urpy too!!! 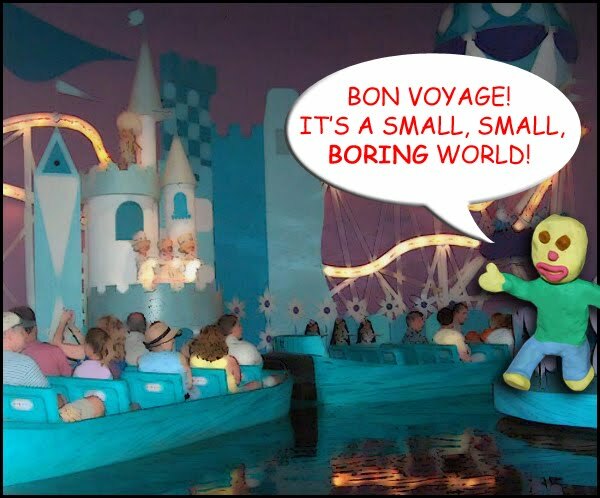 Even though I'm sweet, I think I would not like It's a Small World!!! 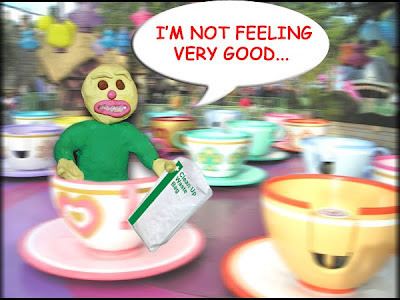 That Tea Cup ride makes me feel queasy, too. Oh! And I see Kathy made a similar comment. Well, Mr. Shrill at least used a sick bag. That's more than I can say for my experience. Ahahaha!!!! Well, he is far braver than I .... I won't go NEAR the teacups!!! !